Portland Public Library (PPL) is pleased to announce it has received a $50,000 grant from the National Library of Medicine (NLM). These funds will support programs to bridge the gap in access to health information for our patrons, focusing on the most vulnerable members of our community — teens, immigrants and refugees, and patrons experiencing homelessness. 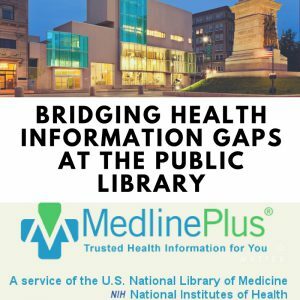 As part of the grant, Portland Public Library staff will receive training on an online resource called Medline Plus. We will offer workshops, community discussions, and direct interaction with health professionals and organizations, in order to build awareness around health information resources and provide opportunities for deeper engagement around the issues most critical to our community. All library programs are free and open to the public. Some programs have limited spots and will require registration. A complete listing of all library events can be found on our website. You may also request information by calling the reference desk at 871-1700 x725.